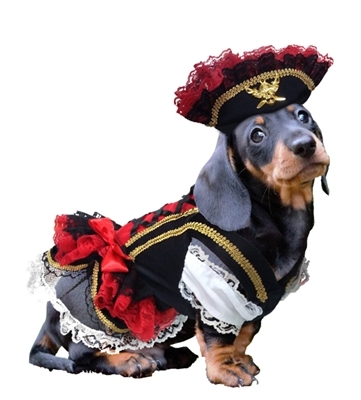 Ole' Buck Pirate Halloween Dog Costume features a Black velveteen dress body with Gold rope stitched trim and embossed pirate buttons, red corset vest with black satin ribbon crisscross the front with lace trim. The petticoat is trimmed in white lace and the bottom of the black dress body trimmed with gold stitched ribbon, red and black, Multi-layered lace skirt. White sleeve trim and white lace for front leg opening. The red satin bow finishes off the dress body. Top it off with our Black and Red Floral lace trim, Pirate hat lots of fabulous golden multi reflective fancy trim, the metallic pirate’s medallion finishes off the detail of this fine piece of pirates treasure. Hand washable, comfortable and easy to wear with front Velcro closure. Costume of high quality with the attention to detail.